100gsm Laserproof Bond, 120gsm Laserproof Bond, 130gsm Gloss, 130gsm Silk, 170gsm Gloss, 170gsm Silk, 250gsm Gloss, 250gsm Silk, 400gsm Matt Laminated, 400gsm Uncoated Bond, 600gsm Matt Laminated. Touch and feel all our lovely FSC stocks with our FREE sample pack. SPECIAL BONUS! 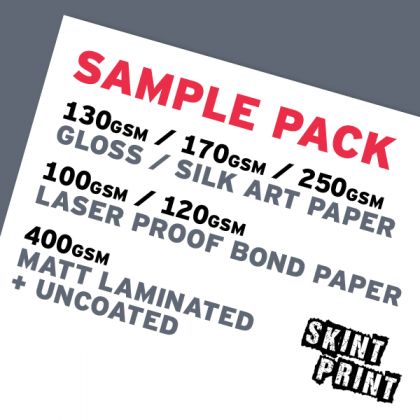 Our new sample packs contain a £5 voucher, redeemable on your first order with us!